Read a sample chapter: Seashells! Stunning full-color photography dominates each spread; particularly intriguing are the whelk egg case and the hermit crab toting its adopted shell. The text is brief but clear, serving mostly as extended captions for the photographs. 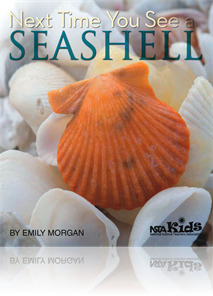 Morgan notes that she intends her offering to inspire wonder and stimulate questions rather than provide facts for memorization, and she recommends its use with children who have some prior experience with shells. Appended with photo notes, suggested activities, and a recommended website, this will be welcomed by teachers following the National Science Teachers Association’s observation-based learning guidelines as well as young families returning from a trip to the beach. These books expect to inspire in students a sense of wonder at natural phenomena and also to encourage readers to wonder things for themselves. … These books would be great accompaniments to a nature table, or as invitations to exploration for students to use independently, but would be equally effective as “coffee table” books for students to browse during quiet reading for example, as a simple reminder of some of the amazing features of our world.